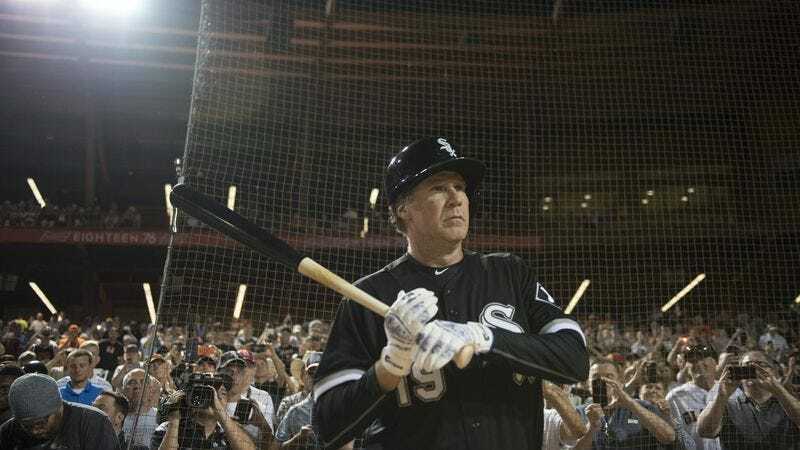 Ferrell Takes The Field (HBO, 10 p.m., Saturday): Looking to match the record of baseball great Bert Campaneris (and to amiably screw around for an hour), Will Ferrell sets out to play all nine positions for ten different, very obliging major league teams in a single spring training day. If the concept of Ferrell pulling the legendary “conceptual comedy Plimpton” isn’t enough to amuse you, then the fact that all proceeds of this HBO special are going to fight cancer might earn a few charitable laughs. But, considering how Ferrell’s commitment to oddball projects has paid off over the years, you can probably count on laughing for real and donating your unused pity laughs to the cause. Erik Adams is oiling up his baseball glove for the review. Also his comedy glove. You have to oil those. Blunt Talk (Starz, 9 p.m., Saturday): Walter would like to be a better father to his youngest son, but the news that his ex-wife is dating a rock star sends him into a tizzy. Of course, it doesn’t take much to send Walter into a tizzy. Brandon Nowalk hopes that his review doesn’t set Patrick Stewart off—he just couldn’t handle that sort of noise. Survivor’s Remorse (Starz, 9:30 p.m., Saturday): Joshua Alston’s been telling us all that this series—about a young NBA player and his family—is underrated stuff. If you’re not listening to Josh, then, well, that’s on you. Tonight, Cam is stressed about his first game back in Boston, possibly worried that Celtics legend Dave Cowens will leap out of the stands and cream him going for a loose ball. Always a 10-20 per cent chance of that happening at any given time. Casino Royale (BBC America, 8 p.m., Friday): Remember when we thought Mads Mikkelsen was menacing just because he cried blood and clobbered Daniel Craig’s testes? Strike Back (Cinemax, 10 p.m., Friday): Wait, it turns out [redacted] is actually a secret agent for [country redacted], and [gender redacted] is planning to torture Scott and Stonebridge? That is some cold [redacted]. Z Nation (Syfy, 10 p.m., Friday): Syfy’s very own zombie apocalypse series returns! In the second season premiere, our ragged band of heroes continue to try to sneak the cure for the whole zombie thing past some even more raggedy walking dead. While it’s no Walking Dead, our own LaToya Ferguson once said it ain’t so bad as all that. Continuum (Syfy, 11 p.m., Friday): The fourth season of this Canadian time-traveling detective series kicks off as bad guys from the future come back to present-day Vancouver to hunt down Keira and maybe catch a Canucks game. The Stand (El Rey, noon, Saturday): Because Robert Rodriguez loves Stephen King, his network is playing all six hours of this 1994 miniseries adaptation of King’s doorstop of a post-apocalyptic novel. And then he’s playing at again at 8 p.m.! You cannot escape. College Football: Oregon At Michigan State (ABC, 8 p.m., Saturday): Strangely, ducks put up a decent fight against Spartans. You’d think that would just be a massacre, really. The Murder Pact (Lifetime, 8 p.m., Saturday): Four rich socialites try to cover up an accidental death, but then start receiving I Know What You Did Last Summer hints that someone’s saying I Know Who You Are And I Saw What You Did. Hmm—this may be sort of derivative, come to think of it. Documentary Now: If there’s something like a perfect parody, it might be this episode where Bill Hader, Fred Armisen, and co-writer (with Hader) John Mulaney, an impeccable riff on Errol Morris’ The Thin Blue Line. Kayla Kumari Upadhyaya gave it an A. You should listen to Kayla.